Stand out from the crowd with a completely custom, responsive WordPress theme to match your design, built with ease of use, flexibility, and security in mind. 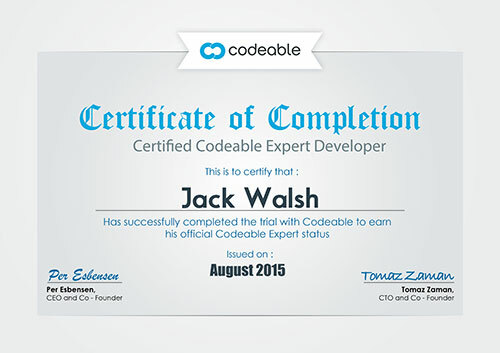 As a certified WordPress expert developer, I have been building websites for over a decade. Whether you need a business website to showcase your company, a eCommerce solution (we use WooCommerce) or a website for a non-profit, I've got you covered. If you need design, development, hosting, SEO or anything WordPress website related this is your one-stop shop for all things website. Jack is excellent. We use him all the time. No more wrestling language barriers and bad service with overseas workers. You get a certified WordPress expert developer that understands your problems and issues related to website design and development. I've designed, developed and deployed completely custom, fully responsive, Google ready sites for a wide range of business clients, non-profits and individuals. The high quality of work I produce is evident in the sites I’ve designed and developed over the years. Allow me to provide you with a truly great experience by listening to your requirements, providing exceptional communication, and delivering your project on time with the highest quality. Did great work for both of my projects. Very honest, hardworking, and responsive. Jack is a great developer and communicator. He was on point the entire task, did what was asked, and was very accommodating. A pleasure to work with. It has been an absolute pleasure working with Jack. Quick and efficient service, as always. Jack makes the web development process easy. He is very easy to work with understands the coding and design details. Has a great eye for responsiveness and mobile details. Highly recommend hiring Jack! JACK WAS GREAT TO WORK WITH, BEING NEW AT WEBSITE DESIGN, I ASKED A LOT OF QUESTIONS AND MADE A LOT OF CHANGES, HE WAS VERY PATIENT, AND KIND WITH ME, AND CLARIFIED WHY CERTAIN CONCEPTS I HAD WOULD NOT WORK. THANK YOU JACK FOR ALL YOUR HELP! Jack was super quick to help me and take a look at my site. He was friendly, responsive, and within a short timeframe helped me fix the issue I was having on my site. I highly recommend him.